Showers of Blessings: TWENTY NINETEEN! Today, I'm posting two letters. Sometimes I'm weird and I write letters to things that aren't people. It wouldn't feel right without doing something for the New Year, so I thought writing these letters would be a way to end last year and begin this year! I have also linked to some of my blog posts throughout 2018 that I want to keep alive. 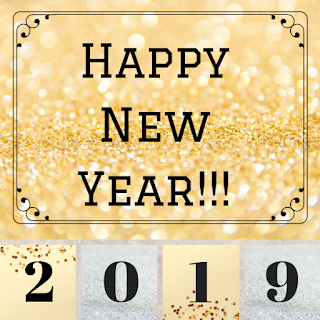 Also, at the end of this post, I am giving you some really important insider information about what's happening on Showers of Blessings in the new year! For a year that has gone by so fast, you have sure put a lot of changes in my path. Overall, you were a good year, you definitely had your ups and downs. This year was filled with many blessings, but also so many challenges. But through those rough patches, I am a better person for it, because I grew closer and closer to my Savior. This last year, one of the things that I am so thankful for is to have been given the opportunity to start a blog and join this amazing blogging community (aka the blogosphere), where there is just as many deep and heartfelt posts out there as there are fangirl confetti. I have "met" so many girls that share the same interests as I do and it is so awesome to see how God works through Showers of Blessings! I can't wait to see where He takes this blog in the new year. There were so many adventures I went on in 2018! I tried many new things and went on quite a few vacations. I went zip lining, parasailing, mud runs, and triathlons for the very first time in my life. I stepped out of my comfort zone and did things like shadowing future job options and taking my written driving test to get my temporary drivers license. In this last year, I have also realized my dream for writing a book and becoming self-published! In 2018, I turned 18, which is a milestone! This past year, I have and still am learning about trusting God in the unknown, even when I don't know Why certain things happen. I am so grateful to have been given another year. Twenty eighteen, I will look back on you with fondness, because even through the tough times, I would like to think of those times as refining me. I don't mean to sound melancholy, but goodbye 2018. May I always remember the memories I made in this year! I have to admit, saying twenty nineteen does not have near as good a ring to it as it was saying twenty eighteen. You know, new year, I'm not scared of you like I probably should be. Your just another 12 months, 52.143 weeks, 365 days, 8,760 hours, and 525,600 minutes. No, I didn't do all that math by myself! Ok, so you might be just a little bit intimidating, but... moving on! Twenty nineteen, you will no doubt have your many ups and downs, your joys and trials, but it is my hope that I will turn to God in those bad times as well as the good times. In this next year, I want to accomplish my goals, but also rely on His plan for this year. I want to be able to step out of my comfort zone more and be bold for God. I want to cultivate my writing and if it is in His will, I might just become a author and not just a writer. I want to love those around me and cherish the time I have with those who are with me through thick and thin. I want to be still and know that He is God. I want to watch Him paint my Brokenness into Masterpieces. I want to find my Special Mission. I wish to Stay Awestruck of of my Creator and live more fully because of Him. I wish to be a witness through the words I write and also to the people I meet. I wish to strengthen my trust, knowing that I have a Trust Rope to hang on too when I'm falling. I wish to be more knowledgeable of the Bible. I wish to find True Joy and not just search for temporary happiness. I wish to be a better sister, daughter, and friend. So many adventures await in the year of 2019, and it is my hope that I will be ready for all that this coming year brings. In 2019, I will learn a abundance of new things, and in this next chapter, I will grow. I will grow stronger and closer to Jesus. Because He will never fail me. His love for me never fails. So, hello 2019, may I live this year with memories and not just dreams! Happy New Year y'all! This time of year is not just for looking back on the last 12 months of our lives, but also looking forward to what the next chapter has in store of us! That is why I wrote these two letters and I thought I would share them with you. Maybe they can encourage you, because if you are anything like me, change can be hard. So, I am praying for you in this new year, may we all stand strong in Christ! I encourage you to write a letter to 2018 and 2019. You don't need to share it with anyone, you could hide it under your bed if you want! But it's good to acknowledge the good times and the difficult times over the year. I see a lot of girls around the blogosphere that are picking words for their years. I thought this was a really good idea and started thinking about my word all the way back in the early weeks of December. And I have to admit, it was so hard picking one word, there are so many words that I could pick! Words such as courage, joyful, simple, trusting, faithful, bold. All of these are so good, but the word I chose wasn't of that list. I chose a humbling word Unfinished. Don't worry, nothing big at all, because I am rather happy with my blog design! I'm not sure when I will get these changes up, but I would like too soon! I want to tell you all some of my ideas and give you a heads up as to whats going on. -I am going to put some quotes on my sidebar. -Reorganize my Pages and add Pages. -Figure out how to do a picture and About Me intro on the sidebar. -Maybe post a (life or writing or bookish or tag) post once a month on a day other than Wednesday? Tell me your thoughts on these ideas! I want to hear what Showers of Blessings' readers like about my blog and how to make it more user friendly and better displayed. January will be the usual posting schedule of posting every Wednesday trading off between a devotional and poem. The last Wednesday of January will have a wrap up post as usual. March will be another fun month because I have asked each of my immediate family members to take over my blog for every Wednesday and post whatever they would like too! They could talk about some of there interests, life on Winds of Faith, photo dumps, recipes, devotionals, interviews, whatever they would like to share! It's going to be a blast! So tell me what you think of my ideas! P.S. This is my 50th post!!! I like the word you chose: unfinished. It describes what we are till death, and how God works throughout the unfinished pieces to create something awesome. I hope your year has started well. Yes, God is still working! Thanks for reading this post. Happy new year! I’m looking forward to the posts you have planned! I loved your letters. We were with a couple of close friends over the new year and wrote letters to each other to open in a years time. It was lots of fun. And your word: unfinished. I just really like that, it has so much meaning! Love your letters, a great way to kick off the year! Wow, hard to believe it's almost been a year of blogging!! I think every year is full of ups and downs, honestly. There's always joys and occasions to learn. Yes, I know! It's crazy how one year goes by so fast! Wow! I don't know why, but that was one of my favorite posts! :D Writing to a year is something I would do too, lol. ;) I'm excited to read your 2019 posts! Sounds like a lot of fun! :) Cheers to a new year in the blogosphere and your 50th post! On New Years day we went over to our neighbors house for lunch. I got to see my cousin i haven't seen for a few months. Sounds like you have a lot of fun posts planned! That sounds like a lot of fun! I'm glad you had a good New Years! And A GIVEAWAY???? YES! I LOVE givaways! 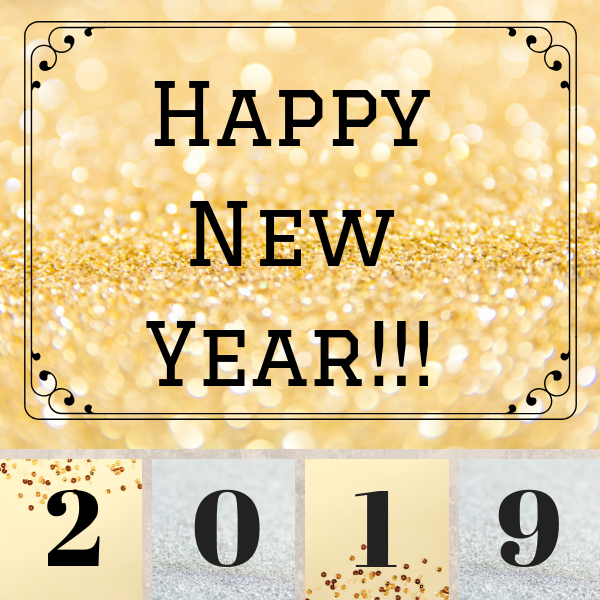 I'm excited to see what 2019 holds for your blog!!!!!!!!!!!!!! I LOVE your header!! Are two of the pictures of you and Rosie? Yay!! Are the three giveaways going to be done at the same time? My birthday is the first week of February; do i get an extra entry?! :P JK!